Dating back to ancient Chinese times, the Jadestone holds a significant and mystical place in society. Jade stones were a part of every Ancient Emperors’ beauty chest in China. Jade was considered to be one of the most powerful stones of immortality, and Emperors even had suites made out of Jade to wear. In the realm of crystal healing, Jade is known to protect against negative energy and balance your Chi (Energy/Lifeforce). I’m sure it doesn’t come as a shock when I say that I am open to the woo-woo side of life and beauty. So, what is so mystical and powerful about the Jade stone? Jadestone was traditionally used to flatten and soothe wrinkles, clear fluid congestions, increase blood circulation, stimulates collagen, and tighten pores. It is also known for it’s healing properties and Chi alignment. Say WHAT?! Have you ever woke up with a puffy face and swollen eyes? Yeah, me too. I find that using the Jade Roller first thing in the morning has helped reduce the puffiness on my face. It feels so soothing to roll the cold stone on my face as soon as I wake up. It’s important to drain your lymphatic system since there is no “pump” to keep the lymphs circulating. When this system is not drained, there is a build-up of fluid in the tissues which can lead to swelling or puffiness. Jade Rollers are fast and easy to use. You want to roll your Jade Roller in an upward and outward direction and then down the neck, as this is believed to lift the Chi/Energy. Most articles and blogs I’ve read suggest putting on your serum and moisturizers first, then use your Jade Roller. I think the opposite works best. I use my Jade Roller on a clean face and neck for at least 60 seconds, then apply serum and moisturizer by gently patting the product into my skin. The absorption of your serums and oils are based one molecular absorption which you can do with pressing and patting the product into your skin with your hands. Remember when applying your eye cream, you want to use your ring finger and pat very gently around your eyes as this is the most sensitive area on your face. Traditionally, Jade was always kept in silk to protect it. Jade Roller Beauty sent me a box with a beautiful silk pad that I keep my roller in. The Jadestone naturally holds a cooler temperature. I like to keep mine in the refrigerator to also act as a cold compress. 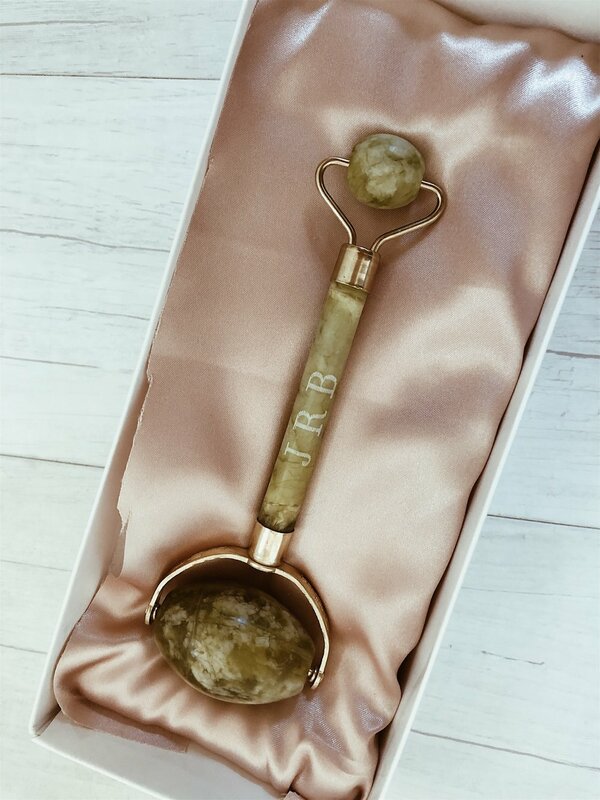 In the same way your body can feel relaxed and refreshed after a deep tissue body massage, a facial massage using the Jade Roller can feel similar. Feeling replenished and rejuvenated, I notice after 2 weeks of use that my skin has more of a glow and has less inflammation in the morning. This is because gently rolling outwards will decrease puffiness and fluid retention. The oxygen from increased circulation allows the skin to calm inflammation. Regular use will make you look brighter and more awake. Each stone varies in color from a very pale to a dark green. The stone is hand cut so sizes can often vary. Take care when handling your Jade Roller as it is handmade and delicate. You want to use gentle pressure when using this tool. I also recommend purchasing from Jade Roller Beauty because it’s authentic jade stones. Real jade is not cheap. Fake Jade holds no benefits in regards to your chi energy. To purchase your Jade Roller click here.